In October, I had the pleasure of presenting a program on early tourism at the 2013 Minnesota Resort and Campground Association Fall Conference and Expo held at Grand View Lodge’s Gull Lake Center. It is interesting to see how a large resort like Grand View Lodge, on Gull Lake, near Nisswa, has conserved the old resort traditions, yet meets the new demands of a changing public. In the late 1970s, I met with other teachers at Grand View Lodge for a statewide meeting. In those hurried days my focus was on education issues and I didn’t really observe the resort as I would have liked to have done. Vaguely, I remembered the considerable distance between the lake and the lodge. Near that time, a friend and I and our kids camped at the Corps of Engineers Dam and Recreational Area on the Gull River where it exits Gull Lake. I would learn years later that there was a relationship between the lodge and the dam. The 400 foot distance between the water and the lodge was evidently due to the inconsistent levels of Gull Lake before the Lodge was built. In 1912 a permanent dam was constructed at the outlet which ultimately could raise the level of Gull Lake up to five feet. The historic resort, located on the northeast side of Gull Lake, started as a hunting camp in 1915. The following year it was promoted as “Gull Lake Park” by Marvin V. and Harriet Baker, who sold 50 foot by 200 foot lots for cabin sites. Within a short time they decided to build a lodge for buyers’ use. From 1918-1920 the present lodge was built using Norway (red) pines from the property. 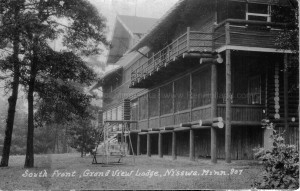 According to resort literature, the Grand View Lodge, along with 320 acres, was sold in 1937 to Mr. and Mrs. Reynolds Frederick Brownlee (“Brownie”) Cote. 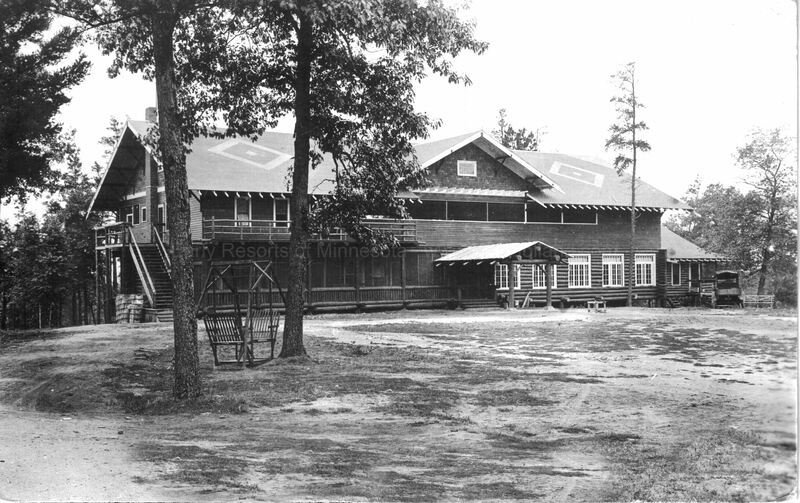 The Cotes owned Camp Lake Hubert for Girls and Camp Lincoln for Boys (click here to see my earlier blog entry on Camp Lincoln). They bought the Grand View Lodge and its ten cabins as a place for parents to stay when delivering or picking up their children at the camps. By 1955 Grand View Lodge could accommodate 175 guests. It had the Main Lodge, thirty-eight cottages, a golf course with free golf, and 800 feet of sand beach. It was AAA and Duncan Hines recommended. By the 1970s Grand View Lodge was accommodating 225 guests and was one of Minnesota’s leading resorts. 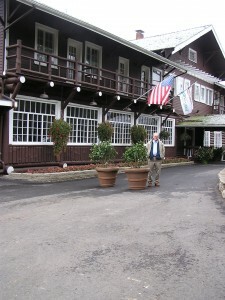 The Main Lodge has been listed on the National Register of Historic Places since 1979 as an example of early log construction in Minnesota resort lodges (click here to see the listing). Its design cannot be altered and only materials authentic to the early 1900s can be used in its maintenance. 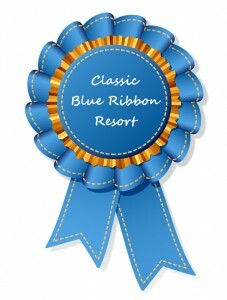 The resort has remained in the Cote family since 1937 and has won numerous state and national awards. Today, along with the historic lodge, guests can enjoy championship golf, a conference center, fine dining, wine tasting, beach and boating activities, waterslides, pools, a spa, children’s programs, special group and holiday activities, winter specials, and more. 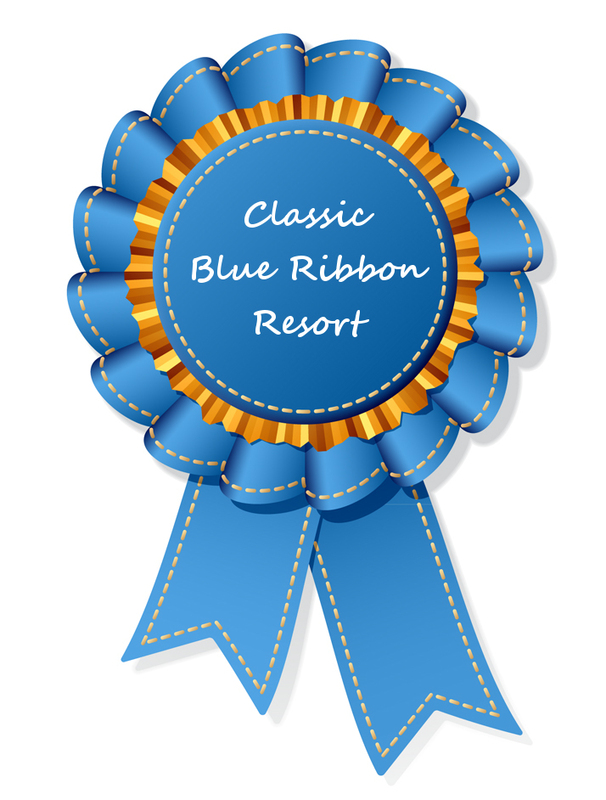 As it prepares for its centennial milestone, it is clear that Grand View Lodge is a stellar example of a Classic Blue Ribbon Resort.